Intercoms are electronic communications systems which consist of fixed microphone/speaker units that connect to a central control device. There are two basic types of products: hard wired and wireless. Hard wired intercoms are connected by cables and are installed in buildings, apartments, offices, and manufacturing facilities. Wireless intercoms rely upon radio frequency (RF) transmission and are used in television stations, broadcast control vehicles, power plants, and communications facilities. Residential intercom systems consist of two distinct types: Full House Intercom and Doorbell Intercom. The Full House Intercom system consists of at least one master station usually located in the kitchen and remote stations in the bedrooms, patio and front door. This system can be used strictly for communication or can incorporate sound. The sound portion can consist of a basic AM/FM stereo tuner or a CD or tape player. The “new” Doorbell Intercom, connects to the house telephone, and will ring every house phone that is connected to the main telephone line. The visitor’s call can be answered from any telephone. An additional feature will allow the homeowner to grant access by automatically unlocking the door from the telephone keypad. 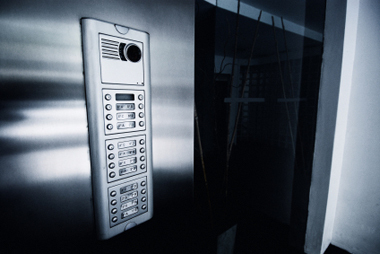 Commercial intercom systems are generally designed specifically to the customer’s application. These systems are as basic as telephone intercom paging systems and as advanced as voice evacuation systems for factories and large industrial complexes. Apartment intercom systems generally interface or connect with the main telephone system in the building complex. By accessing the lobby intercom station the visitor connects with the tenant’s telephone. The tenant then grants entry by pressing the “*” button on the telephone keypad, which releases the door lock granting entry to their guest. Video cameras have been added in lobbies so the tenant can view the visitor on a television station before granting entry.